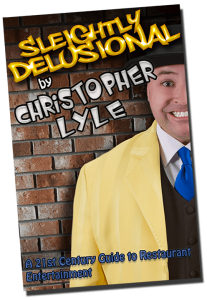 On the Magic Cafe, it’s been said that Christopher Lyle can walk into any restaurant he wants and walk out with a gig. He details his strategy in this post at The Magic Cafe. 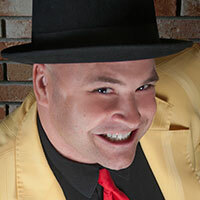 Christopher offers some insights into performing at restaurants. • How he qualifies restaurants before he approaches them. • Which restaurants he will and won’t go after. • How he pitches restaurants in person. • Keeping your gig once you have it. • Why he doesn’t do contracts with the restaurants. • Promoting outside gigs at his restaurants. • Signage at the restaurants. • Talking to the restaurant owner about card on the ceiling. If you’ve ever wanted to work in restaurants but just didn’t know how to get started, or have been working restaurants for some time now and need a fresh perspective on how to change it up, then THIS is the book for you. “Slightly Delusional” is available as a digital eBook for sale for $30.00USD. Pick up your copy here! How he ended his run at a pizza joint after ten years. His ten-year run at the pizza joint mentioned above. Learning how to play well with others, especially online. • How he started getting gigs after moving to Dallas. • Perform as much as possible for as many people as possible. • His online image, mainly on the Magic Cafe. • Targeting your marketing efforts. Jeff Hobson’s Multimedia CD on running a successful business, only available directly through Jeff. Where can we find Christopher Lyle?